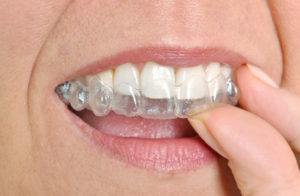 Patients typically wear each set of aligners for about two weeks before exchanging them for the next set in the series. Invisalign aligners should be worn for 20 to 22 hours a day and can be easily removed to eat, drink and brush your teeth. If you have Invisalign and are going to a happy hour with friends after work, be sure to follow the 4 below tips from a cosmetic dentist in Yuba City. When you take out your aligners to enjoy dinner and drinks, make sure you store them in a special hard case to avoid accidentally damaging them. If you only wrap your aligners in tissues and place them in a coat pocket or in a purse, they can easily become lost or damaged. Any delays in treatment to replace damaged aligners would likely cost you more time and money. Drinking water while your Invisalign trays are in is okay, but other beverages are too harsh on the plastic. If you go out for some happy hour drinks after work, be sure to take out your aligners to avoid damaging them. In addition, stick to clear drinks like white wine or gin and tonic – the pigments from dark drinks like red wine or certain beers can stick to your teeth and later be transferred to your aligners. Speaking of beverages, keep either a bottle of water nearby or order a glass of water along with your alcoholic drink at a bar or restaurant. Sipping water can help rinse your mouth if you don’t have time to brush your teeth before putting your aligners back in. Pack a portable toothbrush so you can clean your teeth before reinserting your Invisalign trays after dinner. Not brushing can allow food particles and plaque to become stuck between your tooth enamel and aligners, which can accelerate the rate of tooth decay. You do not have to sacrifice your social life while straightening your smile. Just follow the tips above to enjoy a social hour out with friends while still sticking to Invisalign treatment. Dr. Ajaipal Sekhon has been helping patients in Yuba City achieve happy and healthy smiles since 2008. He understands the importance of a confident smile, which is why Fit Dental offers Invisalign treatment to help straighten crooked or gapped teeth. Patients interested in realizing the straight smile of their dreams should visit the Fit Dental website or call the office at 530-822-9090.